AMSTERDAM, THE NETHERLANDS--(Marketwired - Dec 9, 2013) - Business conferences have long inspired attendees with guest speakers, groundbreaking information and even the occasional creative presentation. But rarely will a delegate enter a conference space and experience a professional epiphany just from looking at the royal blue curtains and endless rows of chairs. 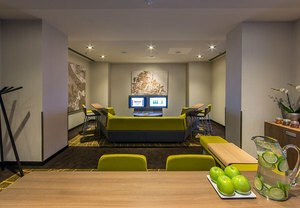 The Amsterdam Marriott Hotel, however, is changing all that with its highly conceptualized new meeting rooms. And the results are unequivocally impressive. With some of the first "people-inspired" meeting spaces ever created, the property not only stands out among hotels in Amsterdam's city center but among hotels throughout all of Europe. Instead of cavernous ballrooms with jumbo screens and stages, delegates find themselves in rooms that feel like a creative office space. Groupings of furniture within open floor plans create multiple gathering spaces within each room for an effect that is ideally suited to networking, interactive classes, business meetings and even those traditional presentations that once defined the meeting experience. But at this Amsterdam conference hotel, even those feel refreshed, thanks to state-of-the-art technology and lighting, abundant windows and fresh color palettes. Pre-function spaces have also been reimagined. Taking a cue from Marriott's trademark lobbies, these areas encourage guests to work, network and relax amid versatile seating arrangements and invigorating aesthetics. The idea behind these new function spaces is to cater to the people using them. And with research suggesting that people prefer completing different tasks in different spaces, the creative clustering makes these updated Amsterdam meeting rooms just the ticket to better, more productive functions. They are also the way of the future: More Marriott properties will follow suit in the coming months. But responding to contemporary work habits involves more than pleasing design. Technology plays a significant role too, which is why these meeting rooms feature state-of-the-art capabilities like smart boards, projection walls, docking stations and touch-screen controls. The hotel also recognizes technology is as evolving as it is vital, which is why it utilizes app- and web-enabled services that can adapt to future technologies. Already hotel guests are benefiting from this via services like Marriott's Red Coat app, which allows delegates to make requests in real time for things like temperature control, food service and concierge service as a meeting is underway. 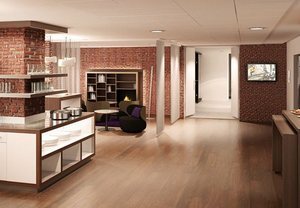 Premier services like this complement the redesigned, futuristic spaces of this Amsterdam business hotel in exciting ways. And for the first time ever, guests may just find that setting foot inside the meeting room is enough to feel inspired. Ideally situated near Leidseplein's restaurants, shopping and entertainment, the Amsterdam Marriott Hotel puts guests front and center to the city's many charms. The hotel's 396 guest rooms and suites drink in views of gabled architecture, iconic canals and picturesque tulips while inviting guests to unwind with air-conditioning, broadband Internet and flat-screen televisions. But with so much to see and do -- the Rijksmuseum, Vondelpark and Van Gogh Museum are just minutes away -- guests can just as easily capitalize on their enviable location. All that sightseeing takes energy, for which the hotel offers two excellent restaurants: Sorel's Midtown Bar and Lounge and Midtown Grill, for the best steaks in town. Corporate guests stay on track within the hotel's 12 redesigned meeting rooms that have been arranged to accommodate modern work approaches with flexible spaces, contemporary colors and state-of-the-art technology. With some of the first "people-inspired" meeting spaces ever created, the Amsterdam Marriott Hotel not only stands out among hotels in Amsterdam’s city center but among hotels throughout all of Europe. Instead of cavernous ballrooms with jumbo screens and stages, delegates find themselves in rooms that feel like a creative office space. The idea behind the new function spaces is to cater to the people using them. And with research suggesting that people prefer completing different tasks in different spaces, the creative clustering makes these updated Amsterdam meeting rooms just the ticket to better, more productive functions.